R.E.M. 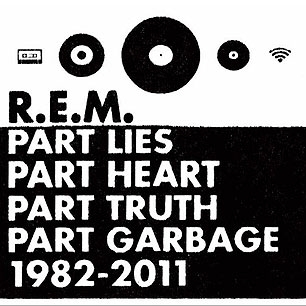 have unveiled the full track list for their career-spanning, greatest hits album Part Lies, Part Heart, Part Truth, Part Garbage: 1982-2011, due out on November 15th. The album will feature three new, previously unreleased tracks–”Hallelujah,” “A Month of Saturdays” and “We All Go Back To Where We Belong”–that were finished after the band completed work on its final album Collapse Into Now, released back in March. The double disc set will include all of R.E.M.’s biggest hits, including “Everybody Hurts,” “The One I Love,” “Losing My Religion,” and “Man On The Moon,” as well as fan favorites like “Begin The Begin,” “Country Feedback” and “Electrolite.” View the full track listing below. Are we likely to see a reformation of REM as a band – new music – another tour ??? can’t get enough of them!!!! !